There's an achievement associated to looting 20,000 of these (Underbelly Tycoon). Which awards you with Ratstallion. You can also get these from Matthew Rabis by turning in these Glorious Earwax Candle. You can obtain Glorious Earwax Candle from Conjurer Margoss by fishing up 25 Drowned Mana. Note that the area near the entrance to the sewers (including where Raethan is standing) is a "staging" area and is a sanctuary like the rest of Dalaran - only when you go beyond this area do you enter the free-for-all area, and become flagged. Returning to the staging area will make you unattackable while you remain there, but only after a 7-8 second delay. There are a number of ways to acquire this currency. Although it is loosely PvP-related (as Dalaran Sewers is often a PvP area) there is no PvP strictly required to obtain it, although killing players will increase your Sightless Eye earnings. The most lucrative activities require that you do not hire a bodyguard - and thus may be flagged for PvP combat. Killing other players while the No Guards debuff is active will net you anywhere from 15 to 50 Sightless Eyes per kill. Note that you will not receive any Sightless Eyes from kills if in a raid group when doing so. There are a number of mini-bosses that spawn randomly, and drop 50-90 Sightless Eye. Some of these need to be tanked, but others don't hit hard at all and don't need to be. The bosses spawn fairly frequently, and at peak times there can be sometimes more than one active (and they can spawn back-to-back) – but they only spawn when the guards are at their post (i.e. free-for-all PvP is not active). These bosses can be engaged even when a hired bodyguard is active. Crazed Mage - A fire mage; health scales. 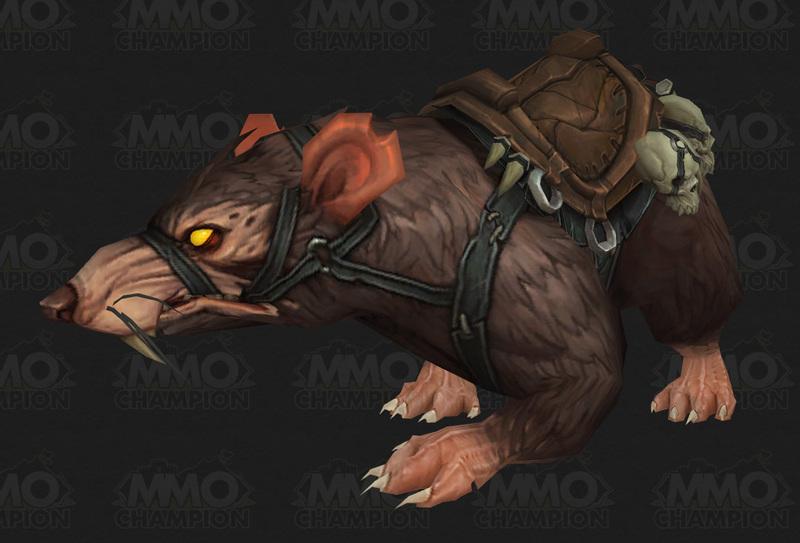 Defeating Blind Rat pets in the Underbelly in a pet battle will reward 75 Sightless Eyes. Note that this pet, required for Broken Isles Safari, only spawns in the Dalaran sewers. Pools spawn occasionally in the waters around the Black Market Auction House called Swirling Whorls, which can be fished from to directly obtain Sightless Eyes. A Fishing skill of 1+ is sufficient for this. Additionally, the item Fel Chum can be purchased for 350 Sightless Eye from Oxana Demonslay. Using it will spawn pools in the Black Market area, which yield Bloated Sewersucker when fished. These contain 3-5 Sightless Eyes each. Typically, fishing from Swirling Whorls directly earn you more Sightless Eyes, so this item is not the best investment! Every so often a quest will appear in the Underbelly - Experimental Potion: Test Subjects Needed. These are available from Fizzi Liverzapper at in the Underbelly. Completing the quest grants 150 Sightless Eye, plus puts a transformation buff on you that turns you into another creature (Kobold, Skrog, Dryad, etc.) and gives you some kind of new ability or passive while in the Underbelly. The buff persists outside of the Underbelly, but the special abilites only apply there. Fishing open water in the Underbelly with Experimental Potion will yield 3-17 Sightless Eye with an average of 10.09 per cast (over 45 casts, so probably not a great sample size). Given that this buff is one of six random effects from Fizzi Liverzapper's 'Experimental Potion' quests and only lasts for 20 minutes, it's not exactly a reliable means of acquisition, but since you'll want to do her quests any time one is available anyway, it doesn't hurt to know the benefit. A rough, hand-minted coin. It bears a symbol similar to that of the Kirin Tor, with one key difference: the eye is closed. Players in the sewers want to earn Sightless Eye to bribe the guards and work towards purchasing recipes, pets, and toys from sewer vendors. Some of the interesting items include Formula: Leylight Brazier, Sewer-Pipe Jelly, Recipe: Flaming Hoop, Recipe: Leather Pet Leash, Young Mutant Warturtles, and Clothes Chest Pattern: Dalaran Citizens. You can even buy food like Underbelly Banquet. If you loot many Sightless Eye, you earn the Underbelly Tycoon achievement and mount Ratstallion!